grass stains: Kids feeling left out of Draw Something? Kids feeling left out of Draw Something? If your kids are feeling left out of the Draw Something craze, but they either don't have an iTunes account or don't have a device on which to play, take heart. My kids, Nicholas in particular, have really enjoyed watching me play Draw Something with my friends (including many of you! ), but they can't play it on their iPod Touches. Nick has played many of my turns with friends, beginning by writing, "Hi! This is Nick," on the screen before drawing. Truth time: he draws just as well as I do. Anyway, since they really wanted to be able to play, we've improvised our own version of Draw Something for the poor, deprived children of the world who don't have their own game accounts: we use the free app Whiteboard. It's available for the iPad, iPhone and iPod Touch, and it has all the features of Draw Something except that you play in person, not over wifi. 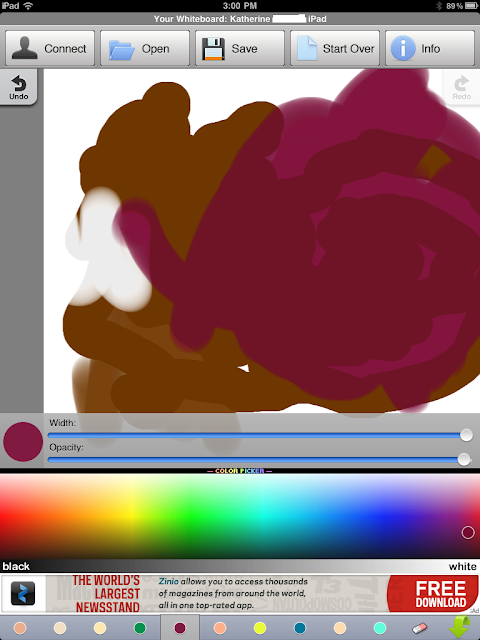 Bonus: you have every color of the rainbow at your disposal, and you can even change the opacity of the colors. And then I got to guess what it was. Bueller? Bueller? Bueller? Please notice his prodigious use of the Opacity Tool. You people are ridiculous. It's obviously a volcano spewing lava. We've been having a lot of fun with it, so I thought I'd share it with you in case you wanted to hook your kids up. You could even use it to play connect the dots or tic-tac-toe with impatient kids while waiting in line for something if you needed a diversion. Happy drawing!